Marianne Cooper, Ph.D. is a sociologist at the Clayman Institute for Gender Research at Stanford University and an affiliate at the Stanford Center on Poverty and Inequality. She was the lead researcher for Lean In: Women, Work, and the Will to Lead by Sheryl Sandberg. She is a contributor to LeanIn.org, a contributing writer to the Atlantic, and a LinkedIn Influencer. She is the author of Cut Adrift: Families in Insecure Times, which examines how families are coping in an insecure age. She is an expert on gender, women's leadership, diversity & inclusion, financial insecurity, and economic inequality. She writes, speaks, and consults about these issues for media outlets, professional groups, and companies such as Amazon, American Express, and Kraft. Dr. Cooper received her Ph.D. in sociology from the University of California, Berkeley. She lives in Silicon Valley with her husband and two young children. 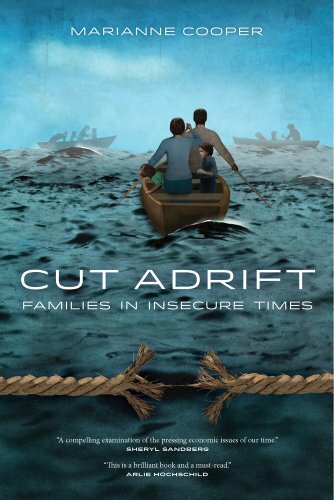 Cut Adrift: Families in Insecure Times makes an important and original contribution to the national conversation about inequality and risk in American society. Set against the backdrop of rising economic insecurity and rolled-up safety nets, Marianne Cooper’s probing analysis explores what keeps Americans up at night. Through poignant case studies, she reveals what families are concerned about, how they manage their anxiety, whose job it is to worry, and how social class shapes all of these dynamics, including what is even worth worrying about in the first place. This powerful study is packed with intriguing discoveries ranging from the surprising anxieties of the rich to the critical role of women in keeping struggling families afloat. Through tales of stalwart stoicism, heart-wrenching worry, marital angst, and religious conviction, Cut Adrift deepens our understanding of how families are coping in a go-it-alone age—and how the different strategies on which affluent, middle-class, and poor families rely not only reflect inequality, but fuel it. Find recent articles, quotes or comments by or about Dr. Cooper here as well as upcoming opportunities to see her speak. Invite Dr. Cooper to inspire your organization or audience with her expertise and insights. She is available for speaking engagements such as keynotes; interviews in print, radio/podcast or tv/video; corporate meetings, events or conventions; and graduations. Please request a quote using the contact form. Need a sociologist's input on your media? Dr. Cooper is available to share her research and expert opinion in writing, comments, soundbites, and guest articles. Please describe the project and request a time to discuss it using the contact form. Dr. Cooper welcomes the opportunity to share her research and expertise with companies and organizations as well as politicians, marketing strategists, product developers, and executives. She is available for webinars and on site consulting on such topics as women's leadership, work/family integration, gender bias, women’s economic power, financial insecurity, and economic inequality. Please describe the project and request a time to discuss it using the contact form.